As some of you know already, People Friendly Stamford has partnered with Mill River Park Collaborative, Harbor Point, Stamford Downtown and Regional Plan Association to create a bike ride and rally to support the Mill River Greenway (and a more bikeable/walkable city) on Saturday, October 11, 2014 from 10:00 to 2:00pm. It'll start with an optional bike ride from Scalzi Park to Kosciuszko Park, which will feature food trucks, music and entertainment. I'm volunteering for People Friendly Stamford when and how I can, and one of the things I wanted to do was reach out to four businesses I'm familiar with to ask for sponsorship. There is a poster and a flyer - both being designed by an astonishingly hard-working and talented person named Emily - that need money to get printed as well as other things that need to be paid for to make the event successful. I sent four emails to each of the four businesses within a few minutes of each other. Before I had finished sending the fourth email, the first person I contacted had already responded with the words: COUNT US IN! The capital letters and exclamation point were hers. And at that point, the tone was set as the other three responded saying they wanted to be sponsors, too. I was four for four. I know I'm an ineffective salesperson so getting them to become sponsors clearly had nothing to do with my interpersonal skills. These folks - and a lot of business owners, for that matter - are already sold on how much better the city of Stamford will be if more people ride bikes in it; and those who aren't need to consider some statistics. Here, in no particular order, are the four businesses I pedaled to this week that I, and every commuter in this city, have to thank. 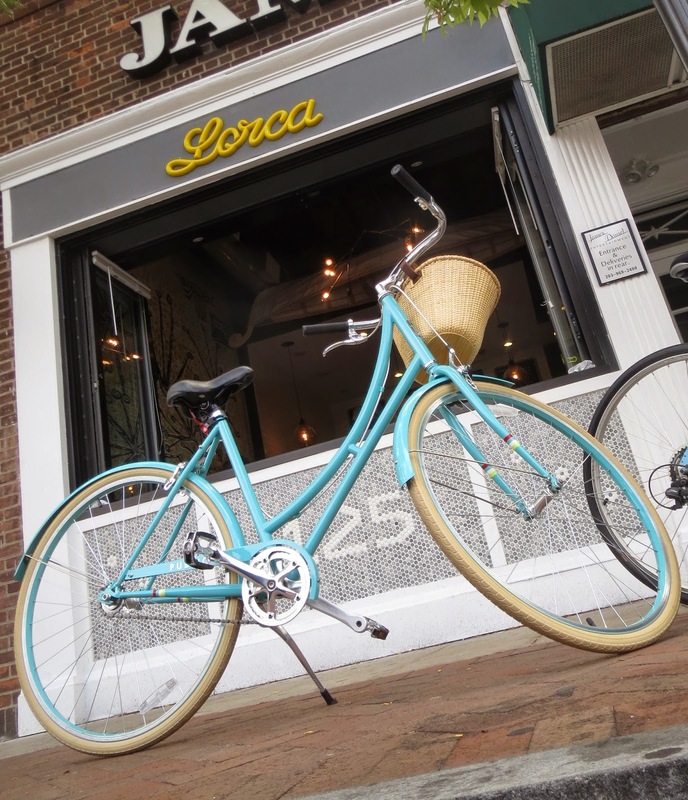 First up: Lorca, which is at 125 Bedford Street. Lorca is the caffeine fueled nerve center of Stamford and the kind of independent coffee shop you wish you had in your hometown. It is led by a woman named Leyla, who once gave a presentation about the art and science of coffee at the Ferguson Library. Take my word for it: she is a coffee Jedi Knight. Lorca hosted my artwork for a month. I meet friends there. And they make a great breakfast sandwich, an always tasty quiche of the day - and cookies. As I've pointed out, I save enough money by biking to Lorca to buy one of their ginger cookies instead of driving, but it is the alfajore cookies that are stuff of legend. I recently hid one in my wife's suitcase when she was about to leave on a business trip that happened to fall on her birthday. When she found it at her destination, a picture of the cookie appeared on Facebook with the hashtag #besthusbandever. That is the power of Lorca's cookies, everyone. Go have one today or order a plate for your next dinner party. Next: Danny's Cycles at 850 E. Main Street - and the only wide photo available is from my Bike to Work Day promotion in May. Danny's Cycles - whose mechanics I have so far been unable to stump with my odd wheel size requests - is also a sponsor. For fans of Folding Bike Week, you know they carry the Dahon, but they also have a lot of other good bikes and accessories. The day I visited, they were talking with a representative from the Connecticut Cycling Advancement Program, which develops youth cycling programs and is presenting next weekend's Connecticut Cycling Festival in Hartford. 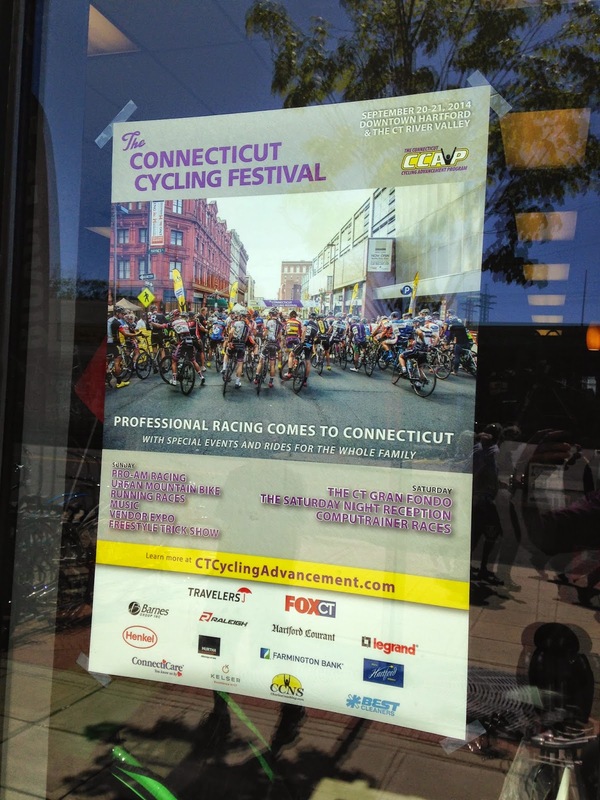 The manager put the CCAP poster in their window before I even had a chance to leave: hope a lot of Fairfield County cyclists register for the Connecticut Cycling Festival, which is taking place in Hartford September 20th and 21st. Next up: Exhale Stamford - and for some reason I do not have a photo of the outside of the building handy, so I offer this. Exhale has a full gym as well as spin, yoga and barre classes. A barre class, for those of you who don't know, is an addictive class that transforms your body into its own torture chamber for an hour but leaves you feeling rather pleasant and energized at the conclusion. You already know how I feel about yoga: it is a great chance to be in a room full of beautiful women once a week and gain flexibility useful when installing a kitchen sink. That isn't a euphemism. But I guess it could be. Anyway: I've met some of the nicest people (instructors and classmates) at Exhale, and right now they are doing a special promotion for first-time guests: one month of unlimited classes for $99. Visit them at 2200 Atlantic Street or go to exhalespa.com/stamford for details - and look for them as the Oct. 11th ride goes right by their front door. 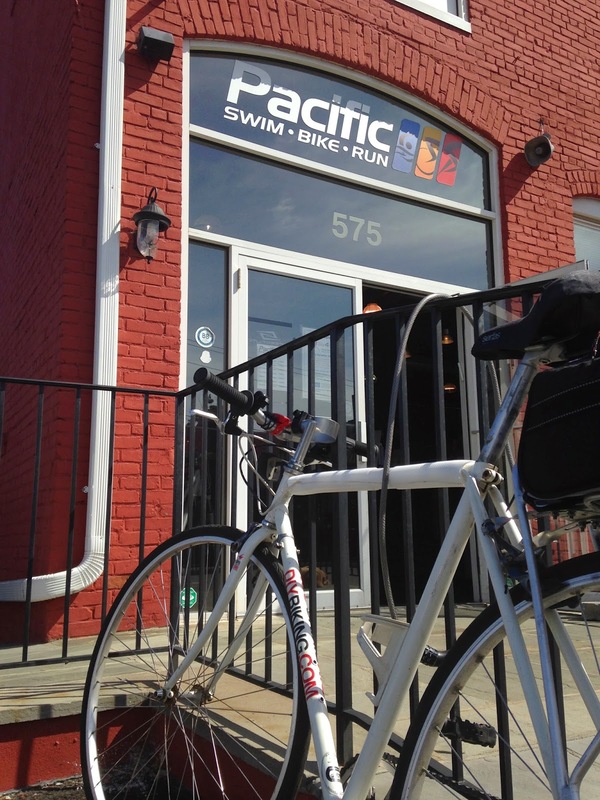 Not far from Exhale is Pacific Swim Bike Run, located at 575 Pacific Street. When I biked there on Wednesday, I was immediately greeted by an enthusiastic and knowledgeable member of the staff. 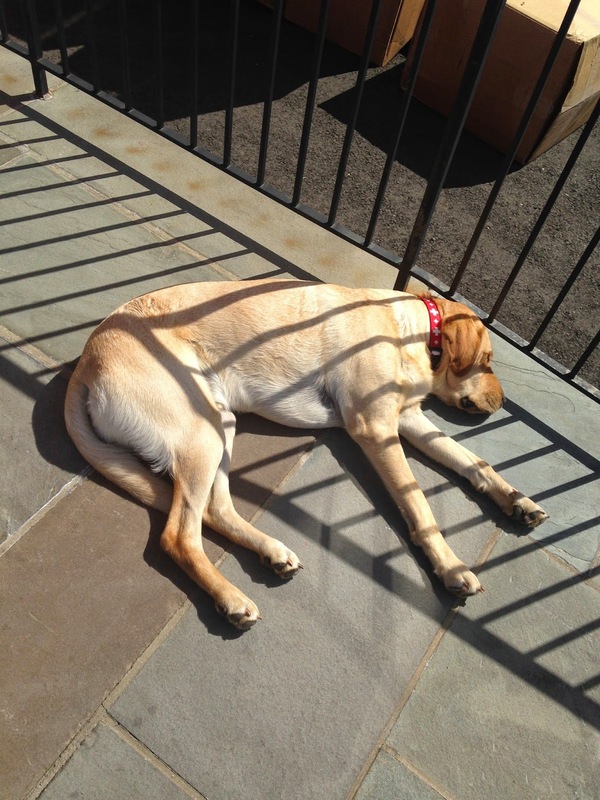 But first I said hello to the dog, Linus, who was relaxing by the door enjoying the warm weather we were having this week. I apologized to the two-legged personnel for being unable to attend what I heard was a very successful bike rodeo the store ran on August 30th (similar to the one I volunteered with at my sister's village in Red Hook, New York). PSBR is the equivalent of the mountain village where Bruce Wayne got his training in Batman Begins - but with better clothing and a nicer atmosphere. In addition to selling some beautiful bikes - some of which cost more than the Blue Book value of my Honda Element - PSBR does high-end equipment rentals, mostly aimed at triathletes in training. 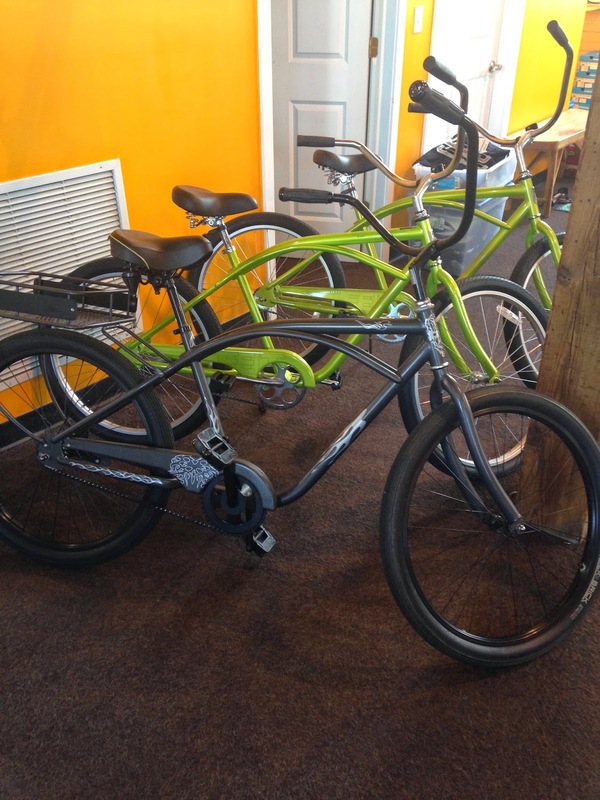 But recently they began doing bike rentals: several comfortable beach cruisers are for rent, so if you want to participate in the Oct 11th rally, don't have a bike and want to rent from a place near the event, give them a call. So those are the four businesses I needed to give a shout out to this week. Others are joining them, and in general businesses are collectively realizing the benefits of bike infrastructure, complete streets, and just intelligent city planning. Be sure to visit Danny's Cycles, Lorca, Exhale and Pacific Swim Bike Run and thank all businesses that support cycling and encourage the skeptics to come around. Thanks for reading and thanks for riding. Great to see this! Stamford needs more businesses like these.